A study was performed in 2003 to 2004 to assess metal and organic contaminant concentrations at three areas in the lower Cape Fear River system, North Carolina, United States. Sites examined were Livingston Creek along the mainstem of the Cape Fear River near Riegelwood, Six Runs Creek in the Black River Basin, and Rockfish Creek in the Northeast Cape Fear River basin. The results of the investigation showed that levels of metals and organic pollutants in the sediments were lower than limits considered harmful to aquatic life. 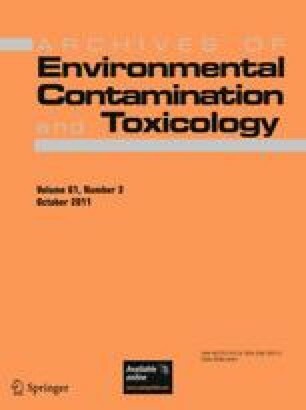 However, results of fish (adult bowfin) tissue analyses showed that concentrations of arsenic (As), cadmium (Cd), mercury (Hg), selenium (Se), and now-banned polychlorinated biphenyls (PCBs), and the pesticide dieldrin were higher than levels considered safe for human consumption by the United States Environmental Protection Agency and the North Carolina Health Director’s Office. Fish tissue concentrations of Hg, Se, and PCBs were also higher than concentrations determined by researchers to be detrimental either to the health of the fish themselves or their avian and mammalian predators. Due to the rural nature of two of the sites, increased concentrations of As, Cd, Se, and PCBs in fish tissue were unexpected. The likely reason the levels are increased in fish and some clams but not in sediments is that these pollutants are biomagnified in the food chain. These pollutants will also biomagnify in humans. In these rural areas there is subsistence fishing by low-income families; thus, increased fish tissue metals and toxicant concentrations may present a direct threat to human health. We thank the North Carolina Attorney General’s Office for funding through the Smithfield Agreement to the Lower Cape Fear River Program at the University of North Carolina Wilmington. We thank James Merritt (UNCW) and Geoff Scott (NOAA) for facilitation and Mike Williams for field collection help. The National Ocean Service does not approve, recommend, or endorse any proprietary product or material mentioned in this publication. Certain commercial equipment, instruments, or materials are identified in this article to specify adequately the experimental procedure. Such identification does not imply recommendation or endorsement, nor does it imply that the materials or equipment identified are necessarily the best available for the purpose.